.. .! .. ... .
e-rated by foreclosures and related distress transfers of mortgaged farms. $6,536,860,000, or almost one-sixth larger than at the beginning of 1944. Michigan 174:308 i6i, 231 150:413, 6 -13-7 156.711 207,232 m, 664 P.? Missouri 2".377 21$ 962 20T.32T 268 0 352 31-6"
Virginia .. 72.299 69.406 65 124 Ita 9.9 30-89T .1" $3,374 42.s sq. daotions of more than 30 percent occurred in six States Kansas, Maine. smallest was in the South Atlantic States (7.0 percent). Nevada, North Dakota, Utah, and Wyoming. dollars : dollars dollars : Pct. : Pot. Pct. : Pct. s Pct. pqnse, and loans called for foreclosure. 2_ Includes joint stock land banks in liquidation snd in receivership. Insurance camissioners and Best's Life Insurance Reports. Includes regular loans. prchase-money mortgages. and sales contracts. Y1 Includes loans made by individuals and other miscellaneous lenders. th years earlier. aS .. 1 +"
Mortgage loans arii out of the program oarrie4, on by tkMe ." of the total farm-wmortgage debt than they held 4 years earlier. On t.i:.! cent for 1944 and only 33.6 percent for 19140. Insured commercial bam,. held about the sam proportion of tho debt on Janawy 1, 19414 as thqy dSA. 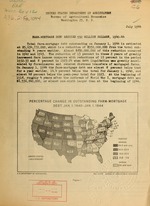 "..
ceontage df the total farm-mortgage debt on January i 1 944I than they wverae . on January 1.9140. The proportion of Federal land bank loans hbU deoliened . mortgage debt so far during World War II has been in hahsp contrast to. doubled in the 5 years ended January 1., 1923.
as compared with $1,403,000,000 in 1914, an increase of almost 44 percent. 20 percent in 1940 and. has since fallen below the 1918 level. in 1918. Two areas had relatively high debt-to-value ratios in both years. York and a number of the New hngland States. ...... ... .. .. ... .. ".. .. ...... ..H..